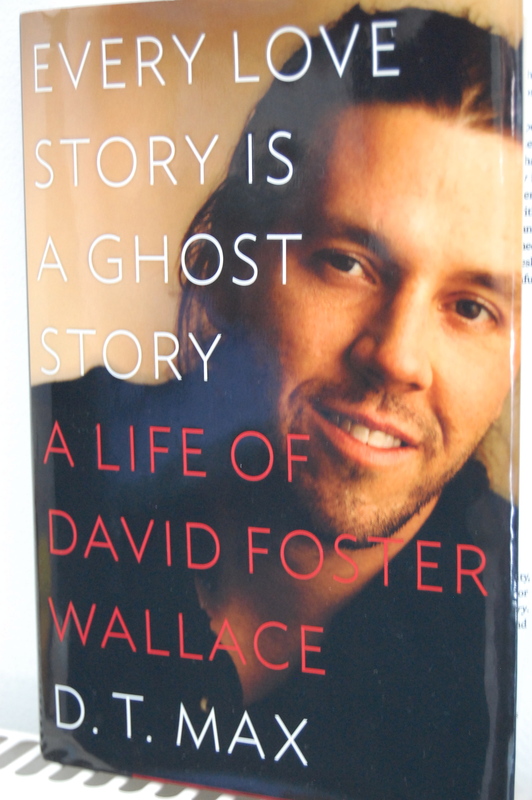 Many months ago, I wrote here at sublime days that I’d soon try to start reading D. T. Max’s biography about David Foster Wallace, Every Love Story Is A Ghost Story. I did start to read the book soon afterwards. But maybe 70 pages into it, I stopped – for two reasons. One, as I had expressed with concern in my 11-10-12 post, it made me sad. But also (two), the author, D. T. Max, kept getting in my way. By that I mean that it felt to me as if his persona were seeping through his words about Wallace, even more than Wallace’s persona was coming through. There’s a lot of ego in the literary world and I found a distasteful amount in the opening pages of the biography – and it didn’t seem to be coming from DFW. Perhaps I just needed a little more time with the book. But “a little more time” didn’t come till nearly a full year later, during the past two weeks in fact. With the myriad things I brought for my two-week stay at Wellspring House Writers Retreat, the DFW book added several ounces of weight (though no where near the amount of weight had I brought Wallace’s opus, Infinite Jest, instead). The book I’m writing, working title Kaleidoscope Chips, is hard for me to write. It’s about the destruction that rage from one person within a family can inflict on each member of the family – both physical and psychological destruction. Some of the scenes are laden with emotion, so this book is slow to unfold. I’ve been writing it since 2010. And I’m only at about 23,000 words. That’s s-l-o-w. The upside of this pace is that during the spells I’ve needed to walk away from my writing throughout the last two weeks, I’ve made a study of writing. Generally, I don’t read anything while I’m at this retreat. I reserve this time for writing only. But with the luxury of two weeks, I did some reading. I’m now at page 215 in the DFW biography. I’ve been away from studying about writing for decades. So, to dive into this book has been a condensed reawakening of stuff I’d forgotten about or never learned to begin with. It’s been great. Thank you D. T. Max. I shall reread the initial 70 pages of the book once I reach the end of the it. I’ll see if I still glean too much of the author, now that I have a more complete idea of the book. If I could summarize what I’ve learned from Wallace, it is that he feels it is not enough for post-modern literary authors to present – in satire, parable, realism or any other form – only the picture of who we are at any given time or place. It is necessary for writers to offer redemption, to present solutions to help humanity move forward and become better. Wallace sees the American culture as being dominated by television and advertisement – so that our behaviors are ruled by our addictions – to T.V. and material things (things fed to us through advertisement) so that we live not freely but in the midst of a spectacle, a false existence that has made us dullards. 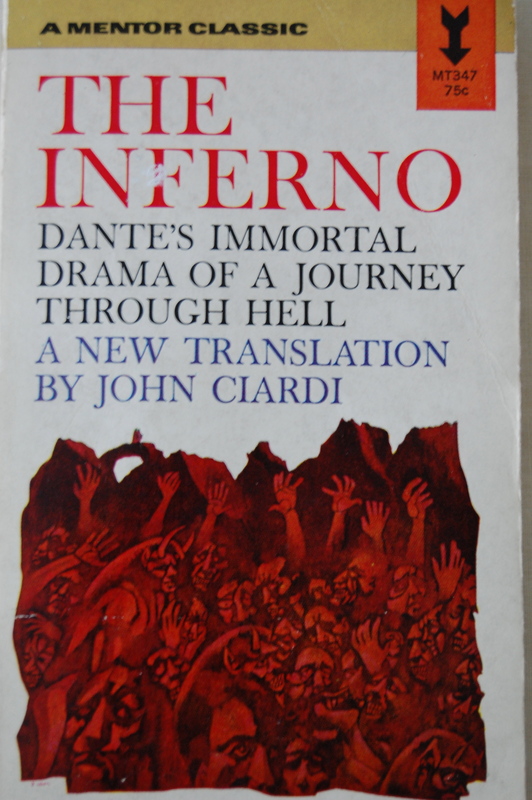 I have also been reading Dante’s The Inferno (translated by John Ciardi) during the past week. I blush to admit I’ve never read it before. I’m happy to say, however, that I am enjoying it completely. Early on, way back in my high school and college years, I fell in love with epic poems and verse. Beowulf, The Canterbury Tales, the Iliad and the Odyssey were all favorite reads. I loved reading Shakespeare. So, to read The Inferno is to go back to my roots, to that time when I fell in love with the art of the written word and its power to inform and enlighten, to challenge and change its reader – and also to pull the reader more deeply into the tapestry of the history of mankind. I don’t know if all this study time alongside my writing time has added an ounce of wit to the quality of my work. I do know that to have this time to study writing alongside actually writing has been wonderful.